In her efforts to clean the apartment, some books are even accidentally thrown out. 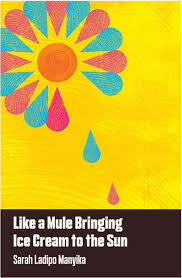 Like a Mule Bringing Ice Cream to the Sun may be the least threatening novel on the Goldsmiths Prize list, but it is a skilled character portrait which gently, but unflinchingly, contends with the fears of ageing, and demonstrates that we should not lose hope. You are currently browsing the archives for the Sarah Lapido Manyika category.